I’m not sure if it’s the upcoming America’s Cup races, Columbus Day, or maybe flashbacks of Lady and the Tramp, but Parties That Cook has decided to spice up its Date Night couples cooking classes. Come October, we’re taking guests on a virtual trip to Italy! Previously international menus of small plates will become themed Italian menus — at least for the first round of regional menus. And what better way to get you amped for a new class format than by sharing one of our favorite recipes from the class?! 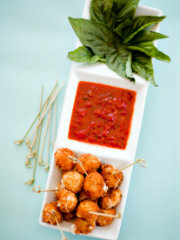 Find me someone who doesn’t enjoy fried mozzarella, and I will…call them crazy. You really have to try these ooey gooey bocconcini bites to understand. When they’re this easy to make, what’s stopping you? As we move into Spring and the weather warms up, you’re going to start to crave more fruit. It’s just a fact of life (much like how Dads are the original hipsters). In any case, these Banana and Mango Spring Rolls are sure to satisfy! The delicious Caramel-Rum Sauce provides just the right “kick” to take this sweet appetizer (or snack) to the top! You can even make them as a post-Bay to Breakers reward! Heat Oil: Heat the canola oil in a wok or frying pan to 360°F. Cut Fruit: Peel the bananas and cut them in half lengthwise from top to bottom. Cut the bananas into a 1/2-inch dice. Cut the mango into 1/2 inch dice as well. Roughly chop the macadamia nuts and mince the ginger. Set aside until ready to use. Sauté Fruit: Melt coconut oil in a medium sauté pan. Add brown sugar, minced ginger, rum and salt; bring to a boil, then add the fruit. Sauté for about 2 minutes until the fruit softens slightly. Remove from heat and transfer to a bowl. Let cool slightly. Mix in the toasted macadamia nuts and coconut right before ready to make the rolls. Make Spring Rolls: Place 1 spring roll wrapper on work surface in diamond shape (1 pointed end toward you and 1 pointed end in opposite direction). Cut off 2 inches of the end pointed towards you. Place 2-3 Tablespoons of the fruit mixture in the center. Fold bottom (now cut) corner of spring roll wrapper up over fruit, and then fold in sides over fruit. Brush remaining unfolded part of spring roll wrapper with water or beaten egg. Roll up wrapper, enclosing fruit completely. The spring roll should look like a log. Place onto a sheet pan. Repeat with remaining spring roll wrappers and fruit mixture. Fry Rolls: Working in batches of about 6 rolls at a time, add spring rolls to 360°F oil and cook until golden brown and crisp, turning often, about 5 minutes per batch. Using a skimmer, transfer spring rolls to a cooling rack over a sheet pan. Keep warm in a 200ºF oven until ready to eat. Caramel-Rum Sauce: Combine butter, brown sugar, salt and rum in heavy medium saucepan. Bring mixture to simmer over medium heat, stirring until sugar dissolves and starts to bubble and turn darker brown. Add coconut milk and whisk until mixture is smooth. Serve: Slice spring rolls in half on an angle. 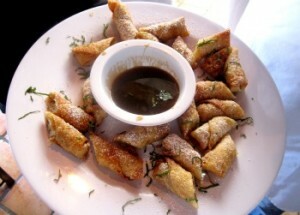 Place sliced spring roll on a serving platter. Sprinkle with toasted coconut, powdered sugar and garnish with mint. Serve caramel-rum sauce in a bowl for dipping.